I had a bit of a moment yesterday, and I can’t quite decide in my head whether it’s a proper achievement or a bit lame. 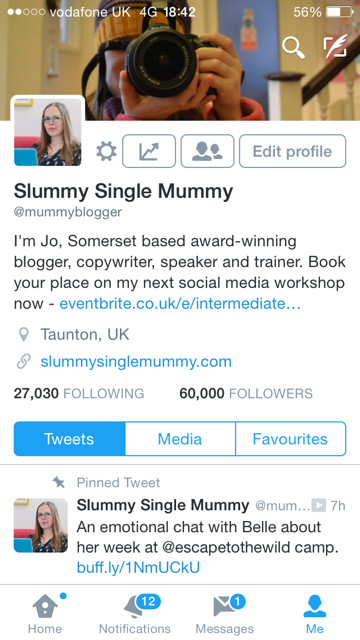 Yesterday, at (roughly) 6,42pm, I got my 60,000th follower on Twitter. It was an awkward moment for me, because on the one hand I wanted to be proud and excited, but at the same time I was struggling with that little voice in my head saying things like ‘yeah, but come on, it’s not a real thing is it? Who plays with Twitter as a job? “But it is real!” I say to the voice. “It’s important for people to connect online and create content that’s interesting and engaging…” and then I trail off for fear of sounding like a bit of a goon. This isn’t about looking for praise, because I genuinely believe that anyone can build up a decent Twitter following if they really want to, (come on my workshop next week and I’ll show you how), it’s more about wondering what motivates that nagging voice and how we can stamp it out. Why is it do you think that so many of us still suffer from that imposter syndrome, even when we’re successfully managing careers and families? At what point does that annoying inner voice shut up and let you get on with things? Congratulations! And to think I was feeling all proud of my 7k! I seem to have ground to a halt again though. I would like to know how you’ve done it, although I can’t make your workshop sadly. I’m even more intrigued with how you manage following 27k! It’s all about lists Jax! I don’t ever look at my home feed, I have lots of people organised into groups. Well I think it IS a big deal and you have done really well! There’s an element of truth in the ‘not a real thing’ thought. Not the achievement – that it real, but that Twitter is not owned by you so if they decided to close up shop tomorrow, your followers would go with them. This does allow some strategy though… How can you take your following and make it something you can control? Maybe seeing if you can get some of that number signed up to your mailing list which you WOULD own. Oh God, I’d not even really thought about it from that angle!! Now I’m terrified!! You’re right though about finding a way to convert those people into ‘mine’ = that’s definitely a good plan. I think it’s a fabulous achievement. Because it does take work to gain a following: you need regular interaction and great contact. And you put in the hours so you do deserve to be thrilled. Nadine’s plan would certainly take it to the “next level”. It makes me want to come to your event! Well done !!! a lot of hard work I am sure but obviously giving people what they want ! Those aren’t meager targets at all!! Those are really impressive numbers and definitely something to be proud of. Of course you’re not being a geek by wanting people to read your stuff – if you didn’t want people to read it you could write it on paper and stick it under the mattress! There’s no shame in wanting to be successful. I was pleased with 1 non family/friend. 60K is inconceivable. Congrats. Congrats Jo! I would have been doing exactly the same thing as you which makes me smile as I always think I am the only person to do things like that. I will however have about a 100 year wait to reach the same heady heights of followers as you. I’m so lazy with my social media interaction. That is a huge amount and well done for getting there. But I often wonder what benefit this has. You cannot see what they are up to as you have too many to even consider looking at what they have done. As you replied to somebody else it is all about lists and targeting the right people. I often wonder why PR people etc want huge numbers as if the 27.000 that you are following are also being followed by thousands and thousands of other then only a small amount of them will ever see what you or other people on their list post and you what they post, so where is the benefit? It’s interesting to think about Elaine, as I do agree with the point you make about only a tiny proportion of your followers ever seeing what you say, but that’s exactly WHY you need the big numbers! I wouldn’t pretend that social media isn’t about business for me – I find it hard work sometimes and it’s definitely a ‘job’ in that sense. A lot of my career development has come through having an established social media following though, which is why I do it. I think it’s about more than the numbers, it’s about what the numbers mean to people – it shows that you can stick at something, that you can follow through, that you can commit to projects, that you’re respected in your industry, all that jazz! Well done. I can never keep it up. I keep changing accounts and blogs. Maybe this time I’ll keep going with your inspiration! That is an amazing achievement. I don’t know as I have the organisational skills to make it work myself. I have no idea how you find the time! When you tell yourself you’re a professional, and that not many people do what you do. Of course they all can, just like you could electrically engineer a shopping center if you put your mind to learning how and finding the work. But they don’t. You do. That’s not tiny at all! !